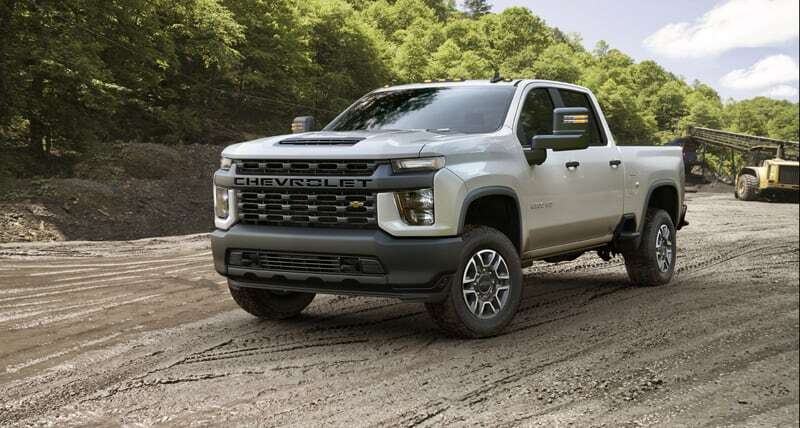 General Motors announces the 2020 Chevrolet Silverado 2500 and 3500 trucks with a new 6.6-liter V8 gas engine, 6.6-liter V8 Duramax diesel upgrades, a new Allison transmission and all-new exterior styles. Unfortunately, we have several fitment flags to report. Love it or hate it, nobody is going to mistake General Motor’s newly announced 2020 Chevrolet Silverado (or 2020 GMC Sierra HD) for any other truck. GM has thrown the safe path out the window and has debuted radical new exterior looks for its popular HD trucks. The recent exterior design trend in trucks has been for manufacturers to blend the look of their half-ton line into their heavy duty line. That’s not what’s going on here. GM believes its HD customers want their three-quarter and one-ton trucks to look entirely different than their half-ton cousins. In fact, they decided that each and every trim level should be visually distinct from the others; Work Truck, Custom, LT, LTZ, and High Country. According to GM, the only sheet metal that’s carried over from the half-ton trucks is the roof stamping. Everything else is fresh; new grilles, new wheels, and new trims. As you might imagine, this new sheet metal also means dimensional changes abound. These changes could mean critical fitment issues for truck campers, or not. More on this later. 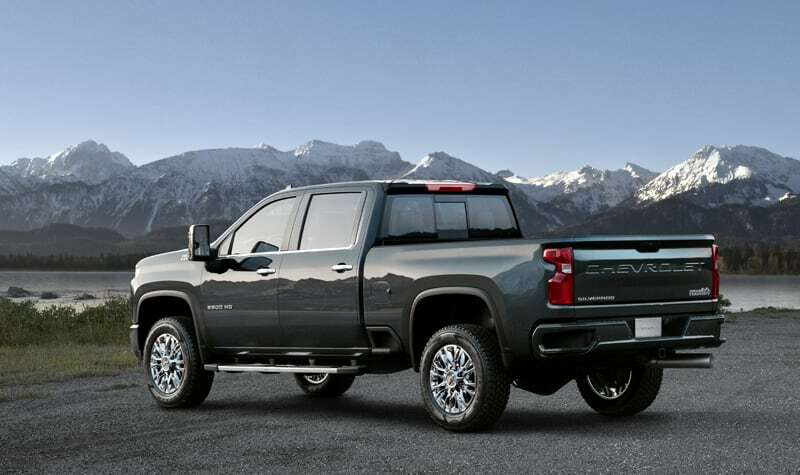 Where the exterior is a bold departure from the new Chevy 1500 series, the interior is essentially identical to the 2019 Chevy Silverado 1500-series. The standard engine for the Silverado HD line-up is an all-new, direct-injected 6.6-liter gas V8 engine. The 6.6-liter gas engine features a cast-iron small-block, aluminum heads, forged-steel crankshaft and forged connecting rods. Mated to the 6-speed 6L90 transmission, the new gas engine offers 401-horse power and 464 pound-feet of torque. That’s 21-percent more torque than GM’s outgoing 6.0-liter gas engine. The improved torque means the gas engine offers up to 17,400 pounds of towing capacity. That’s an 18-percent increase over the outgoing 6.0 gas engine. Of particular interest to truck camper owners, the new gas engine will be available with dual alternators. Properly wired, dual alternators will charge your camper batteries faster while you drive to that next boondocking destination. GM has tuned the 6.6-liter Duramax Diesel to produce 445 horsepower and 910 pounds-feet of torque. 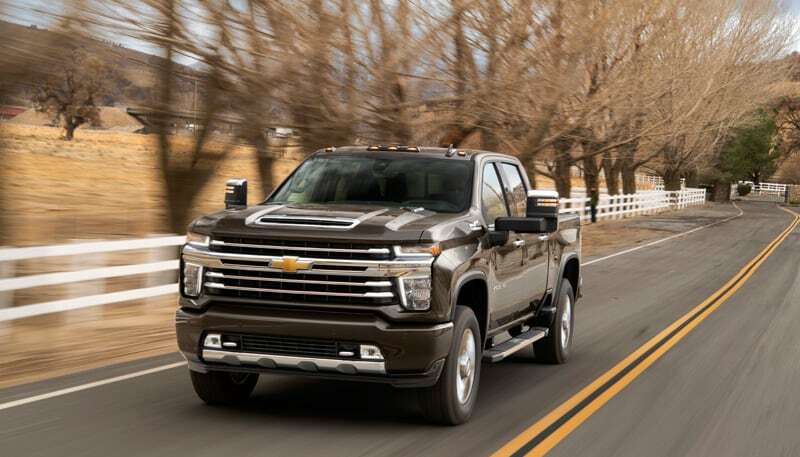 Combined with a new 10-speed Allison 10L1000 automatic transmission, the maximum towing capacity of the 2020 Chevrolet Silverado HD is now 35,000 pounds, a 52-percent increase from the previous generation.